Oh, the places you can go in the pages of a good book! Who doesn’t like reading a good book? I’ve not ever tried a particular reading challenge, rather been tossed along as a pebble in a stream from one book to the next. Sometimes getting stuck in a rut and doing a marathon read of an entire series or settling into one particular genre or the other. This year, POPSUGAR’s 2017 Reading Challenge came through my Pinterest feed right as I was between books, so I decided to add a bit of structure to my reading travels. Several of the titles can go in multiple categories. I’ll list them under the category to which I’m assigning the title. I’ll also provide a link (affiliate) to the title on Amazon.com and to my review (once I’ve written it). Yes, I know it’s a going to be a looong list page with a lot of links. Sorry. Nature of the beast. I’m currently reading The Boys in the Boat by Daniel James Brown and Presence by Amy Cuddy. So far, it’s been a fun. Have a great recommendation for one of the categories? Let me know in the comments. A book recommended by a librarian: Presence by Amy Cuddy. An audiobook: On Writing: A Memoir of the Craft by Stephen King. A book with multiple authors: The Magnolia Story by Chip and Joanna Gaines. A book involving travel: Jaywalking with the Irish by David Monagan for Lonely Planet. A book with a subtitle: Fast Girl: A Life Spent Running from Madness by Suzy Favor Hamilton. A book that’s published in 2017: My Not So Perfect Life: A Novel by Sophie Kinsella. A book about food: Tender at the Bone by Ruth Reichi. A book with career advice: Jump: Take the Leap of Faith to Achieve your Life of Abundance by Steve Harvey. Our review. A book with a red spine: The Immortal Life of Henrietta Lacks by Rebecca Skloot. A book set in the wilderness: State of Wonder by Ann Patchett. A novel set during wartime: The Nightingale: A Novel by Kristin Hannah. A book with pictures: Portraits of Courage: A Commander in Chief’s Tribute to American Warriors by George W. Bush. A book about an interesting woman: The Princes Diarist by Carrie Fisher. The first book in a series you haven’t read before: The Girl in the Castle by Santa Montefiore. A book you bought on a trip: Lone Star Lovers Boxed Set by Jean Brashear. Read through all of the above and still have some of 2017 left, here are a few more options. A bestseller from 2016: Wishful Drinking by Carrie Fisher. A book about an immigrant or refugee: A Tree Grows in Brooklyn by Betty Smith. Our review. A book you got from a used book sale: The Shell Seekers by Rosamunde Pilcher. 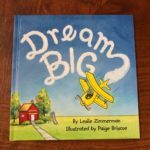 A book that’s been mentioned in another book: Dream Big by Leslie Zimmerman. Our review. A book about a difficult topic: Wish Girl by Nikki Loftin. Have some good recommendations for any category? Let me know in the comments.